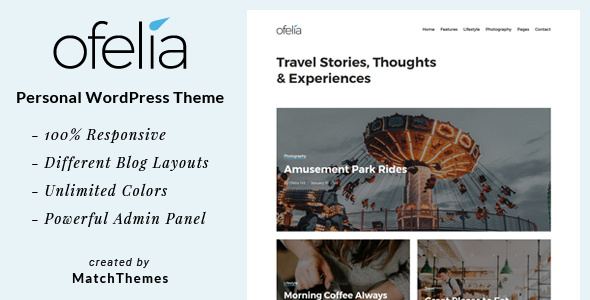 Ofelia is a travel blog WordPress theme for writing and telling stories. Itâ€™s also a great solution for any type of blog website: personal, lifestyle, food, fashion, photography blogging. Ofelia comes with outstanding premium support. The themeâ€™s design is responsive, minimal, clean and modern. Ofelia comes with various blog layouts, different style headers, widgetized footer and theme customizer options ( such as color choices, typography, logo upload , fixed header, article layouts etc. ) so you can easily personalize your website. It follows the best SEO practices, is user-friendly and adapts to all screens and devices. Have a look at the live demo now!